I may only speak for myself, but gears are some of the most mentally satisfying devices. The parts interlock perfectly, giving a small sense of accomplishment when they mesh together. And then you get further enjoyment from watching the gears move simultaneously. No wonder there are so many gear toys for babies and toddlers! 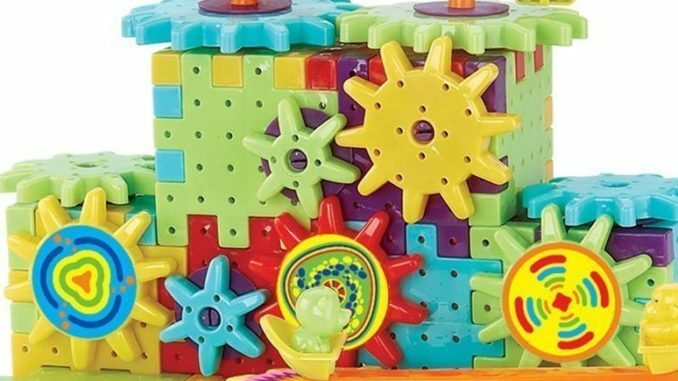 At that age, it can be difficult to find toys that capture their attention, but gear toys seem to do a good job of keeping babies and toddlers engaged. 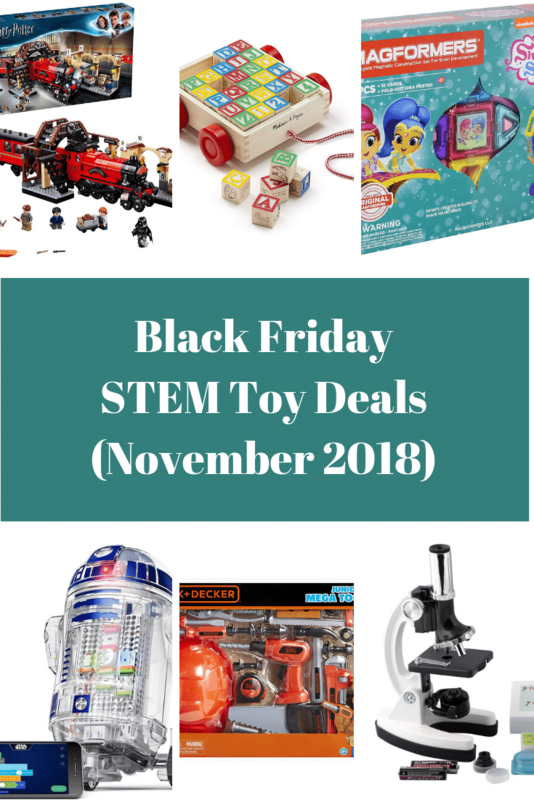 On top of that, they are great for familiarizing children with simple STEM concepts at an early age. 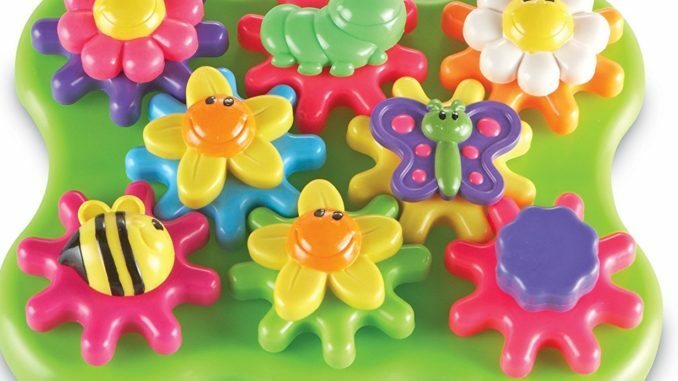 Up first, we have several gear toys for babies, but feel free to skip straight to the gear toys for toddlers section. 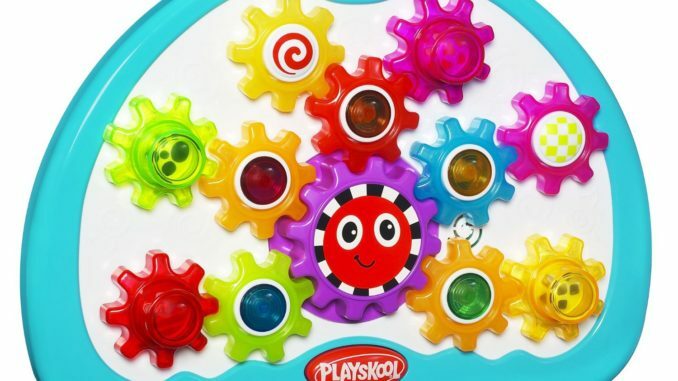 This gear set from Playskool comes with 11 different colored gears with an equal number of plastic pegs on a board for them to be placed. Babies tend to enjoy putting down the gear and then removing. Older babies and toddlers may try to determine the correct way to configure the cogs to make the entire system move. The gears can also be stacked though several parents have reported that the stacks are not stable and can easily be knocked over, or fall on their own. 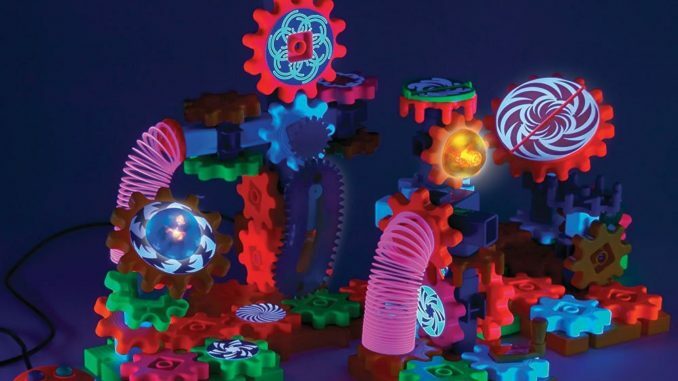 When turned on, the gears will move (if placed correctly) and the lights will flash and the toy plays music. One additional bonus is that the top of the board has an open space that allows children to grip and carry around (though watch out for falling gears!). Not much to say as this Melissa & Doug gear toy is pretty straightforward. 6 gears, 3 colors (red, blue, and yellow), and 3 vehicles (fire truck, school bus, and police car). The rainbow caterpillar does not quite contain all the colors of the rainbow. And unfortunately, the ones present are not in the correct order. That said, this toy has a fun design. And, it is quite practical; in addition to learning about gears, children can practice color matching. Suction cups allow children to put gears on the side of the tub and have a gear-ing good experience during bathtime. Ideally, you would be able to spin all the gears at once by pouring water on the “water-wheel” gear. In actual experience, this does not work so well. But, kids still get a kick out of turning the gears manually, and you can challenge them to see just how many they can get to turn together by just pouring water. 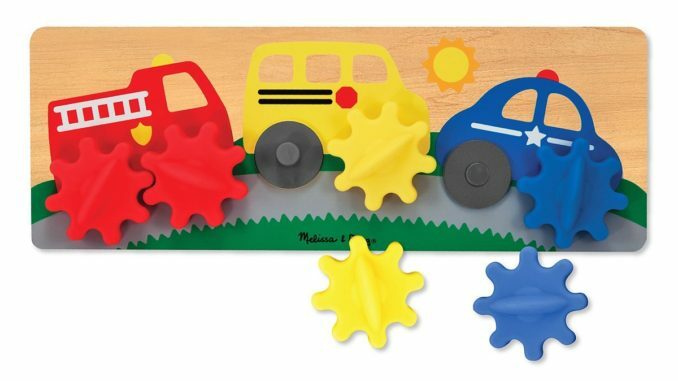 This set from Melissa and Doug provides 8 gears for babies to place and spin on a magnetic board. Parents can work with their children to match the 8 different colored gears with their corresponding pegs. 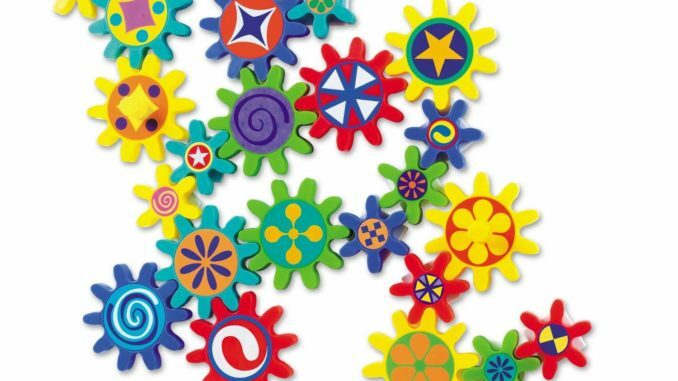 Unique to this gear toy is the inclusion of line-art drawings that the gears enhance (e.g., see the image above) by adding a colorful dimension the artwork. WARNING: Older reviews have expressed concern of magnets falling off. I have not personally used this product, but all recent reviews (i.e., reviews from the previous year) have been positive and do not mention the issue. The Sweet Shop is part of the ever-expanding Gears! Gears! Gears! product line from Learning Resources. As part of the line, all of the gears are compatible with other Learning Resources Gears sets. The candy shop styling may appeal to little builders. 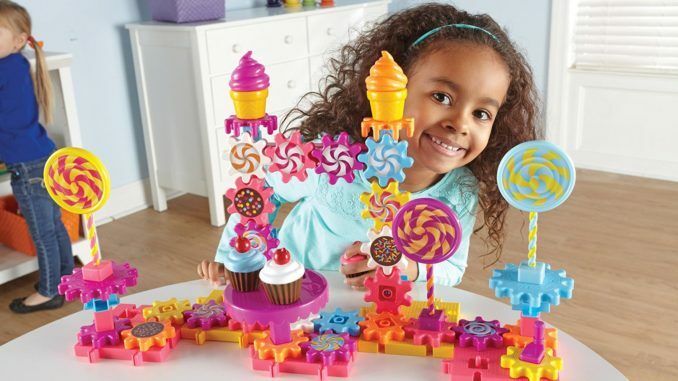 The cupcakes and lollipops are great eye candy (sorry, couldn’t resist) while your little builders learn how to manipulate gears. Again, one of the benefits of purchasing from Learning Resources is the interoperability of all of their Gears sets. In this one, you can add 121 new pieces to your gears collection. What makes the gear set even more exciting, though, is the inclusion motors (3 AA batteries required and not included), flashing lights, and glow-in-the-dark stickers. Parents, probably more than the children, will appreciate the storage tub to hold all of the new pieces. Each set offers a nice collection of 22 colorfully designed gears (10 little, 10 big, and 2 knobs) that allow for seemingly endless mixing-and-matching. For the most part, the magnetic gears work well out of the box when used on horizontal surfaces (e.g., a baking sheet). However, the magnets are generally not strong enough to support the gears on vertical surfaces (e.g., a refrigerator). A common fix is to buy relatively cheap magnets from a general store (e.g., Wal-Mart) and glue them on the back. For just a few extra dollars, you have can have 22 fun gears that will stick well vertically or horizontally. The Italian manufacturer Quercetti offers a 55-piece collection that contains 6 large gears with 6 stickers, 22 axles, 10 gears, 16 interlocking plates, and 1 crank. The pieces are of high quality (for plastic). 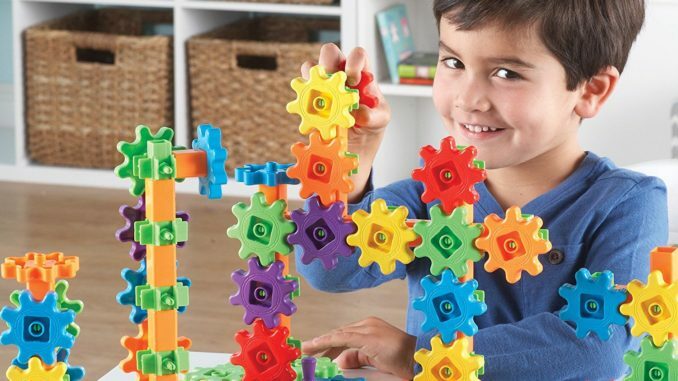 Like other gear sets, children can connect the pieces together and then observe the power of simple mechanics. 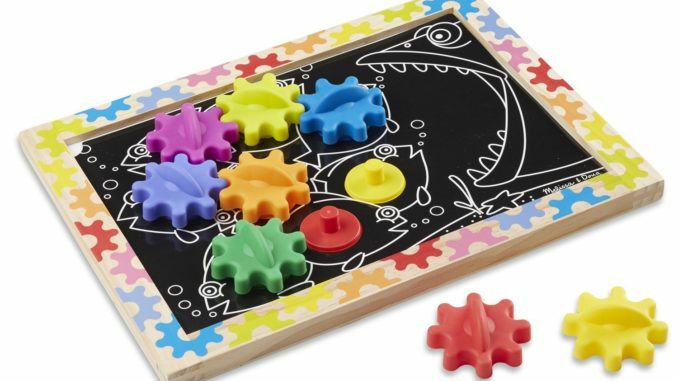 The inclusion of non-gear pieces offers extra learning opportunities as the toy becomes a bit of puzzle at times. Another item in the Gears line, the Movin’ Monkeys set adds friendly primates to the gear action. Like other Gears sets, this one comes with an instruction manual showing how to construct a design. 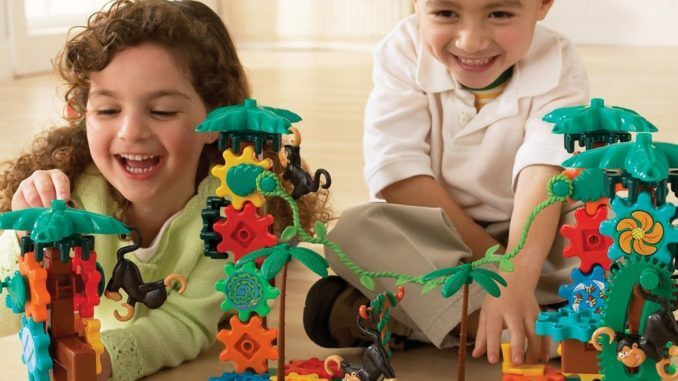 Unlike the other Gears sets, the included design is definitely the primary method of play. Some parents have described this as a downside of the set. But, if your little STEMmer is a fan of monkeys, or perhaps just behaves like one, this may be the set for you. 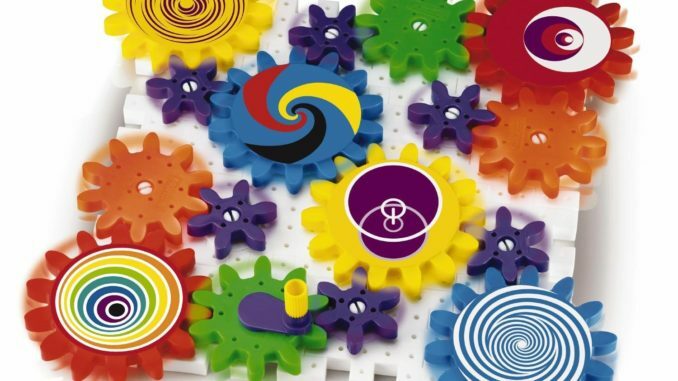 Newdeebee’s interlocking gear set is reminiscent of Learning Resources’ Gears sets in both function and colorful design. 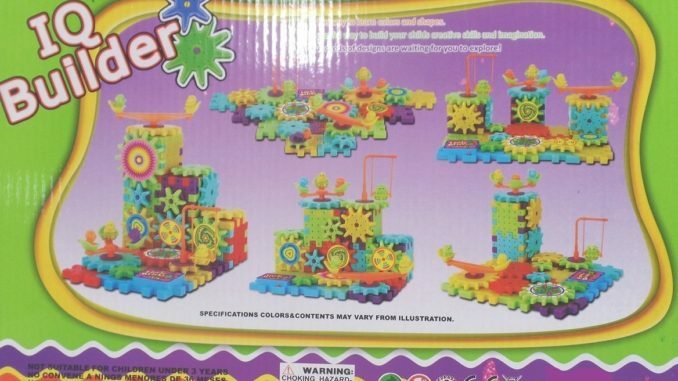 This 82-piece set includes a convenient base, crank, motor, and many gears and axles to enable many different creations. Small animals and stickers add some extra fun and customization to the set. 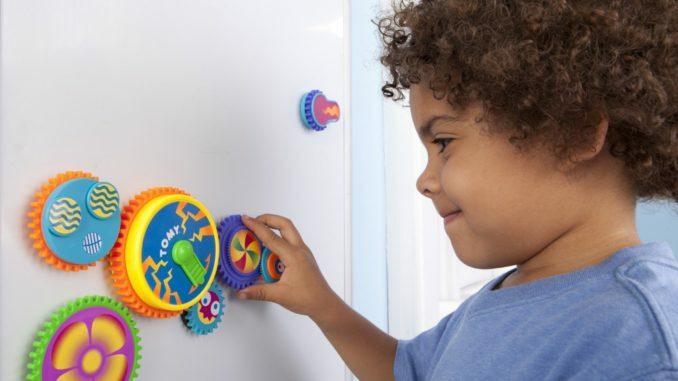 Gearation’s magnetic gear set is designed to be placed on the refrigerator to provide fun for the entire family but especially for toddlers. The battery operated gear controls the motion of the other 4 interlocking gears. 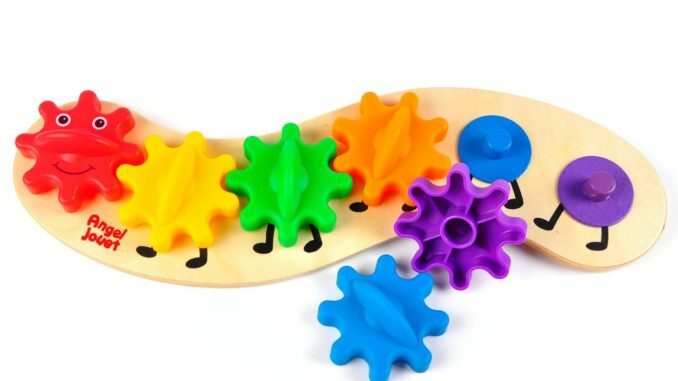 In addition to forwards and backwards movement, the gears colorful designs and amusing sounds provide extra enjoyment. 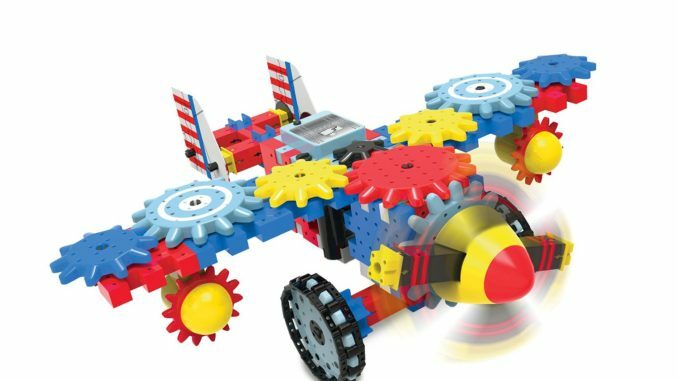 The Aero Trax Plane represents a different idea to gear toys than several of the other times on this list. It trades a more open-ended play design for a modeling kit approach. 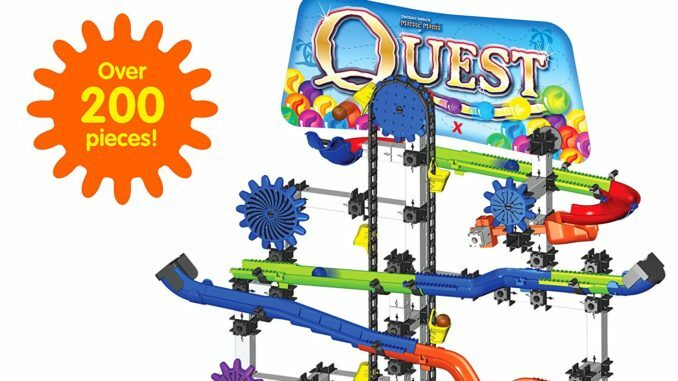 With over 80 pieces, it should keep your budding engineer busy for a while, despite a nice straightforward instruction manual. One concern commonly noted is that the wings may fall off during post-construction playtime. Marble Mania does not emphasize gears as much as many of the items on our list. But, they are an instrumental part of constructing this adventure-themed marble run. 200 colorful construction pieces will provide children plenty of design options and provide opportunities for repeat play value. Note: Lots of mixed reviews on the set. 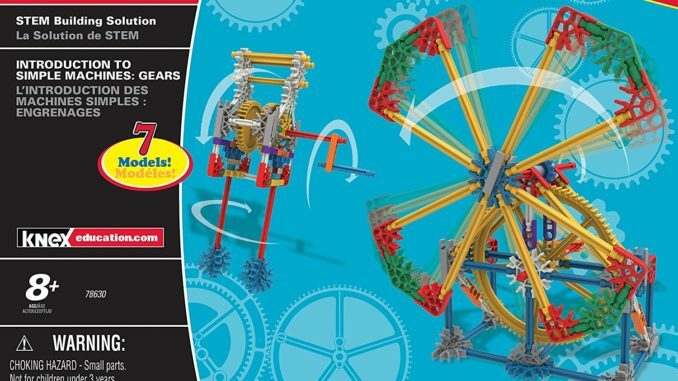 As always, K’NEX Education products include curriculum that you can use to teach your child(ren) about, in this case, gears. The comprehensive guide will introduce real world concepts such as gear ratios and mechanical energy transfer. The instruction manual shows kids how to use the 198 pieces to construct 7 different models, including an egg beater and a chainsaw. And, as a parent, I can appreciate that the gear kit includes a storage container that can hold all of those 198 pieces.